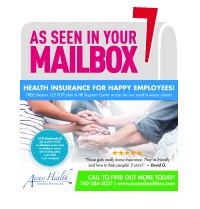 Access Health Insurance Services, Inc. is an independent Health Insurance Agency located in San Marcos, California. We have been in the industry, in North County San Diego, for over 20 years. We focus exclusively on the Health Insurance lines of coverage; Health, Dental, Vision, Life, Long Term Care, Disability, and Voluntary benefits.